Dental implants consist of a small, rod or screw-shaped piece of titanium or zirconium, which is surgically implanted directly into the gum area where the root of your missing tooth used to be. While it heals, this implant will bond with the surrounding tissue, through a process called osseointegration. After the dental implant heals, it functions as an artificial root, to which a number of different restorations, such as dental crowns, bridges, and even dentures can be attached. 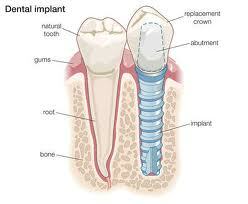 The dental implant placement process is quite simple. First, one of our dentists will perform an initial consultation to determine whether or not you are a good candidate for an implant. If an implant is the right choice for you, our experts will develop a treatment plan based on x-rays and advanced dental imaging techniques. Your mouth will be cleaned and numbed, and your implant will be placed in your gum line. 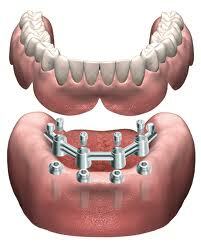 Over the next 3-6 months, the dental implant will integrate with your natural jaw and gum tissue. Once your dental implant has healed, one of our doctors will complete the restoration. If you are missing only a single tooth, a dental crown will be manufactured to match the rest of your teeth, and function as an artificial tooth. 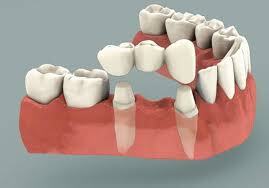 However, dental bridges can also be supported by two dental implants, to restore more than one missing tooth. If you are missing an entire upper or lower arch of teeth, permanent implant dentures, supported by 4-6 dental implants, could be the right option for you. Dental implants have a number of benefits which make them ideal for restoring one or more missing teeth. Natural look and feel – Dental implants and implant-supported restorations look and feel completely natural. Your crown or other restoration will be made of high-quality porcelain, and it will not shift or move in your mouth. The best long-term investment – Dental implants are costly up front, but they are an economical choice in the long run because they won’t need to be replaced throughout the years. No special care required once the implant has been placed – Just brush and floss your teeth normally, and come in for regular, 6-month oral exams and teeth cleanings. Schedule Your Consultation for Implants Today! If you have any questions about dental implants, or you’d like to schedule a dental implant consultation, contact the Fischl Dental Associates team at (847) 864-0822, or stop by our office at 636 Church Street, Suite 200 W, Evanston, IL 60201.